Condoms By Drone: Testing A New Way To Deliver Birth Control (And Other Medical Products) : Goats and Soda A pilot project in Ghana is one of several experiments to see if drones can deliver everything from contraceptives to blood for transfusions. A drone takes a practice flight in Virginia with medical supplies — part of a project to evaluate the flying machines for use in humanitarian crises. She was a mother in rural Ghana. She only wanted four children. But she had seven. That's a story that Faustina Fynn-Nyame told at the Women Deliver conference this week in Copenhagen, Denmark. Fynn-Nyame works with the reproductive health care nonprofit Marie Stopes International. "She was let down by the community, the government and us," Fynn-Nyame told the audience. And there are millions of women like this Ghanaian mom, unable to get access to contraception. But what if you could use drones to transport contraception and life-saving medicines to the world's most remote places? A group of public health experts came up with that idea during a brainstorm session two years ago. And even they admitted it was a bit far-fetched. But maybe not that far-fetched. In the global health care sector, a number of drone delivery projects have been popping up — including one jointly funded by the United Nations Population Fund and the Dutch government. A group of public health experts, local health authorities and private-sector partners dreamed up the idea in 2014 when trying to figure out ways to improve access to contraception for women in the hardest-to-reach areas of sub-Saharan Africa. Access to birth control, reproductive health information and other services for women of childbearing age is a massive problem in this region, where fewer than 20 percent of women use modern contraceptives. The World Health Organization estimates that 225 million women in developing countries would like to delay or stop having children but lack access to reliable birth control methods. Cue the drone. In late November of last year, an unmanned, automated machine with a wingspan of about 50 inches carried about 4.5 pounds of supplies like condoms and birth control pills, as well as life-saving drugs like oxytocin, which prevents hemorrhaging during childbirth, to parts of Ghana. The drone can cover large distances quickly and can take off and land without a runway. The ultimate goal is to get the drone to travel about 60 miles in an hour. Flown by a pilot who's stationed in a nearby health care facility, the drone unloads its delivery to a spot in the village designated for dropping off health products. A health care worker picks up the goods and takes them to the local clinic. If a health care worker tried to do the same job by motorcycle or truck — the typical vehicles used for deliveries — it would take several hours at best. And poor roads coupled with bad weather conditions could make the route impassable. Dr. Renee Van de Weerdt, senior technical adviser of reproductive health commodities at UNFPA, says drones have a huge potential to overcome tough terrain that is common in the region. "They can rapidly deliver supplies that are about to run out," she says. "They might also prove useful in places where there is no ground transport. Many health workers currently have to hand-carry heavy boxes of medicines for long distances." The project is still in its pilot phase. Experts are assessing the cost-benefit of the drone program before scaling it up nationally in Ghana and expanding it to other sub-Saharan African countries. They've got to figure out how much each delivery will cost, and they're also grappling with terrain challenges like dust, which makes it hard for the pilot to see where the drone is flying. A second prototype is being developed with this issue in mind. 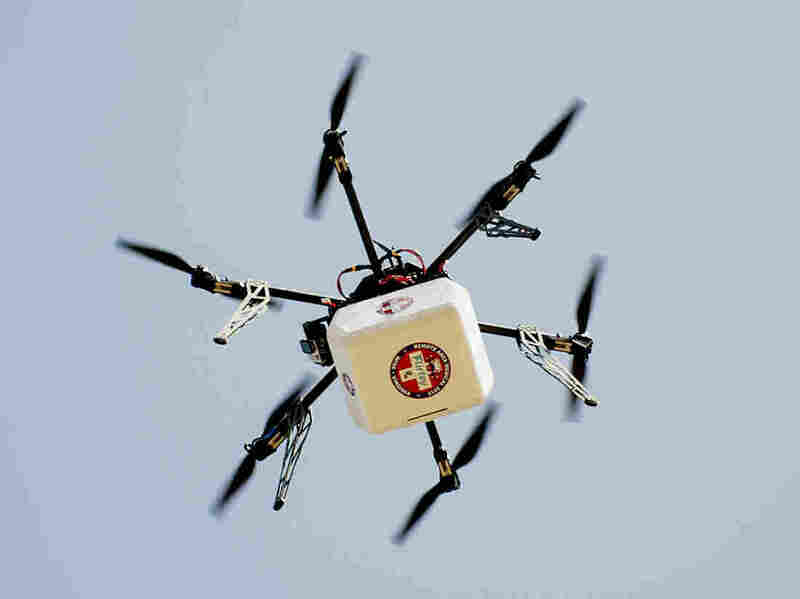 The idea of using drones for health care delivery seems to be catching on. Just recently, Malawi started testing the use of drones to speed up the time it takes to fly blood samples from infants to test for HIV. Rwanda is also experimenting with drones to deliver blood for transfusions to help prevent deaths from postpartum hemorrhage. But a machine can't do it all by itself. Rosalijn Both, a researcher on contraception choices in sub-Saharan Africa from the University of Amsterdam, says people's religious beliefs are also a key factor in providing contraceptive products. "If contraceptives and other reproductive health commodities are simply dropped in remote areas without health education materials in the local language," she says, "I would be surprised if the impact would be big."